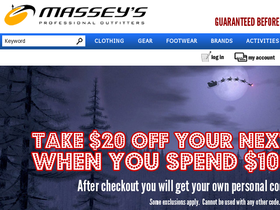 Visit Massey's Outfitters online at MasseysOutfitters.com for all your gear and clothing for skiing and snowboarding. Massey's Outfitters carries clothing and gear from Spyder, Nils, Salomon, Roxy Skiwear, and K2. Massey's Outfitters also carries snowboard gear from Burton, Ride Snowboards, Bonfire, and many more. Save on your next purchase from MasseysOutfitters.com with Massey's Outfitters discounts, Massey's Outfitters coupons, Massey's Outfitters promotions and Massey's Outfitters savings from 58coupons.com. Save up to 65% or more on end of season Clearance items at Massey's Outfitters while supplies last. Click link code to view. Save 15-20% when you buy any of these awesome brands: Quiksilver, Roxy, Hurley, Olukai,Chaco, Reef, Sanuk, and Teva from Massey's Outfitters with this coupon code.